Gernot Mende is specified as the websites creator. 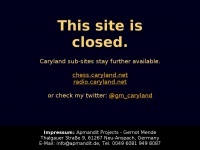 The web server used by Caryland.net is located in Germany and run by KONTENT GmbH. This web server runs a few other websites, mostly in the english language. The websites of Caryland.net are served by a Nginx server. The markup language of the website is HTML 4.01 Frameset. The obsolete technology of framesets is used on the webpages. Due to the robot information on the webpage, the following actions by webcrawlers are not allowed: indexing the website. All other actions by webcrawlers are allowed.